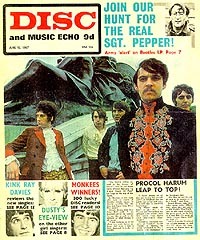 Procol Harum Leap to Top! Click here for a slow-loading but delightful enlargement of this front-page colour picture! 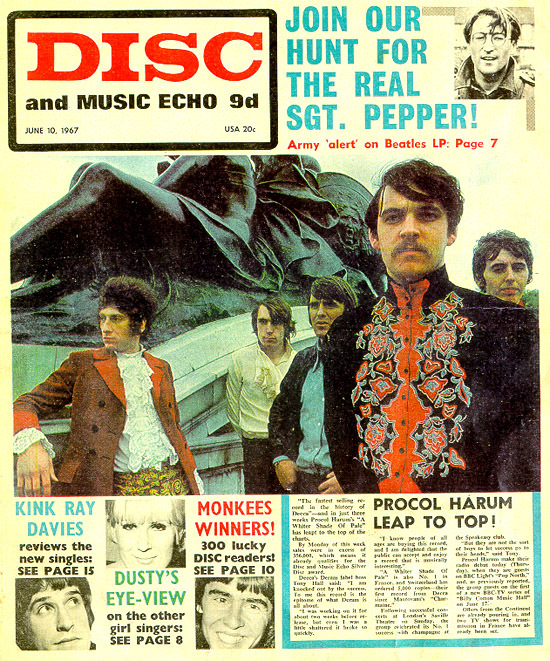 'The fastest-selling record in the history of Decca' - and in just three weeks Procol Harum's A Whiter Shade of Pale has leapt to the top of the charts. By Monday of this week sales were in excess of 356,000, which means it already qualifies for the Disc and Music Echo Silver Disc award. Decca's Deram label boss Tony Hall said, 'I am knocked out by the success. To me this record is the epitome of what Deram is all about. 'I was working on it for about two weeks before release, but even I was a little shattered it broke so quickly. A Whiter Shade of Pale is also No 1 in France, and Switzerland has ordered 5,000 copies - their first record from Decca since Mantovani's Charmaine. Following successful concerts at London's Savile Theatre on Sunday, the group celebrated its No 1 success with champagne at the Speakeasy club. 'But they are not the sort of boys to let success go to their heads,' said Tony. Procol Harum make their radio début today (Thursday) when they are guests on BBC Light's Pop North, and, as previously reported, the group guests on the first of a new BBC TV series of Billy Cotton Music Hall on June 17. Offers from the continent are already pouring in, and two TV shows for transmission in France have already been set.